Embed your Lead Capture on your website or share a direct link. 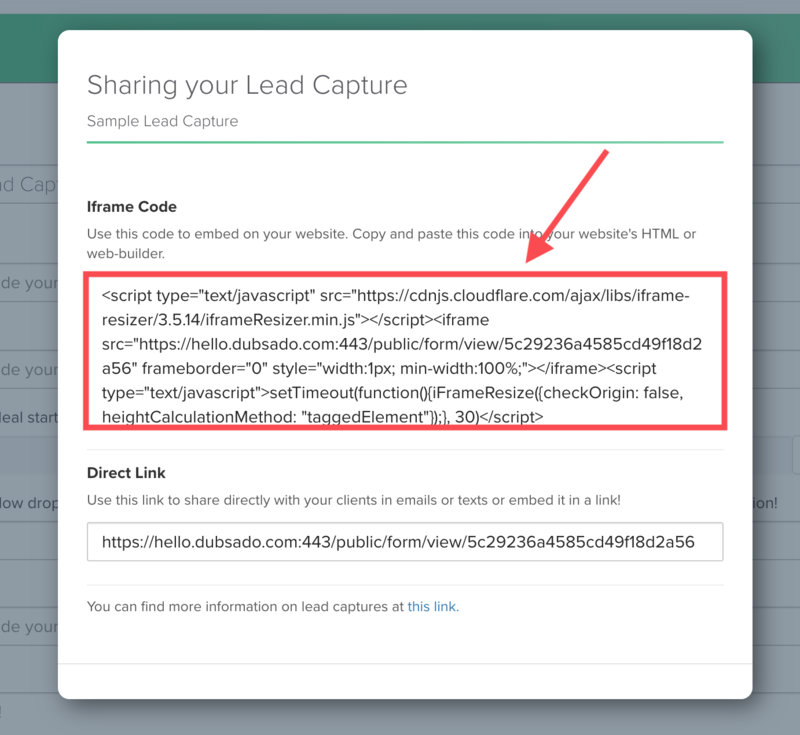 Once you have created and saved your Lead Capture form, you can embed it on your website or share a direct link with potential clients. TIP: We always recommend testing out your Lead Capture before sharing it with the world! Use the Direct Link option described below to fill it out as if you are a new client. For best results, don't enter an existing client's information. Go to TEMPLATES >> FORMS and click on the Lead Capture you'd like to share. Once inside your Lead Capture form, click the SHARE button in the upper right corner. This will open a pop up window. Copy the Iframe Code to embed on your website or the Direct Link to share a URL to the form. Embedding will display the contents of your Lead Capture form seamlessly on your website. This is a great option if you have a "contact" page or similar and want your potential clients to fill out the form without leaving your site. If your web builder is not listed, please contact your web builder platform's support and ask for assistance with embedding your form. No website? No problem! The Direct Link to the Lead Capture will open the form up on a standalone page that your potential clients can access. There is no need to host the form on your own website to use the Direct Link we provide. 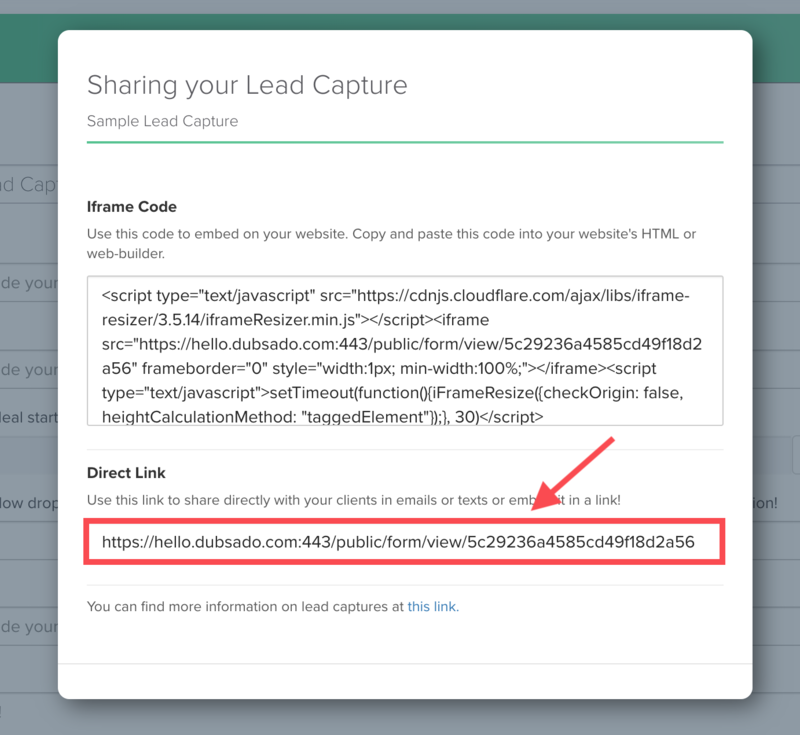 If you want to share your lead capture via email or text, send the Direct Link. It is not possible to embed a Lead Capture form in an email. The Direct Link is also a great option for your business page on social media. For example, you can set the URL of your Facebook Business Page contact button to the Lead Capture Direct Link. If you're having difficulty embedding the form on your site, you can insert a button or simple text link that goes to the Direct Link URL. This is a good option if you cannot embed outside code on your website or are uncomfortable working with HTML. If I make changes to my Lead Capture, do I need to re-embed it or copy a new Direct Link? Nope! Once you save changes to your Lead Capture, those changes will update automatically on your website (if embedded) and at the Direct Link. Can I embed the form on my site and send out the Direct Link simultaneously? Yes you can! You do not have to use one or the other. Both embedding the form and sharing the link will take clients to the same exact form with the same results. I'd prefer to use my own form. Can I bring new leads into Dubsado through another software/plugin? Sorry, but no. At this time only the Dubsado Lead Capture can automatically bring clients into Dubsado and generate new projects. If you choose to collect leads another way, you will need to manually enter them into Dubsado.